Shiseido is a well-known Japanese cosmetics and skin care producer. It is, in fact, the oldest cosmetics company in the world. Shiseido was originally a pharmacy in Japan way, way back in 1872, with an aim to provide high quality medicine. It started to produce cosmetics in 1897 as it introduced its first skin care product, Eudermine, a skin softener and moisturizer which is still available now and rated 4.1 on MakeupAlley. The workshop was held at Marionnaud, SM Mall of Asia. I was supposed to go there with other fellow bloggers but they weren't able to come. The speaker, Ms. Celeste (Shiseido's training manager), started off by telling us about the Shiseido Skin Care 1-2-3 regimen, while Ms. Jessica demonstrated everything on the model. Shiseido says: Remove dirt, pollution and impurities without drying out skin. Make sure your face is clean before applying any product; otherwise, the product will not be properly absorbed into your skin. Shiseido has different kinds of cleansers and makeup removers - oil-based cleansers, cleansing foams, creams, cleansing sheets and many more. Click *here* for the complete list. Shiseido says: Instantly fill skin with moisture and improve skin's receptiveness to further treatment. This is Shiseido's version of toning. It preps the skin for the third step and helps the moisturizer be absorbed properly into the skin. Click *here* for the list of softeners from Shiseido. Shiseido says: Mainly provides skin with oil to lock in moisture in order to restore skin's ideal balance. Moisturizing the skin is a must. Even oily-skinned people need to moisturize from time to time. Use moisturizers with SPF during the day, and use rejuvenating moisturizers at night. Click *here* to see all 27 moisturizers from Shiseido. Once done the skin is taken care of, we can now proceed to makeup application. 1. Prime - Use a face primer to even out the surface of your skin and help your makeup last longer. Shiseido primers: Refining Makeup Primer, Pore Smoothing Corrector. 2. Apply foundation - It is important to select the right shade of foundation for your skin tone. When swatching shades, apply the foundation on your jawline. The shade has to blend with your face and neck color. Don't forget to apply foundation on the small areas of the face (corners of nose and mouth, lid and undereye area, etc.) and along the hairline. Shiseido has different kinds of foundation - liquid, powder, cream. Click *here* to see the complete list of Shiseido foundations. We got to try out the Perfect Refining Foundation which was said to have a finish like that of an airbrush foundation. Look how it blends on my skin. I applied it only on the right half of my hand. 3. Conceal - Remember that less is more. If you don't have a lot of blemishes to cover up, conceal just after applying your foundation. This way, you'll use up less product. There are less chances of caking, too. Shiseido has a corrector pencil, concealer stick and a cream concealer. Click *here* to check those out. 6. Groom the brows - Fill in the sparse areas using an eyebrow pencil or a brow powder. Use three points of the face as guidelines. Imagine a vertical line from the corner of your nose. Extend that line and the upper tip is where your brow should start. Now imagine a straight line connecting the corner of your nose, the center of your eye, and your brow. The tip of that line is where your arch should be. Lastly, imagine a line connecting the corner of your nose and the outer corner of your eye. Extend that line and the tip is where your brow should end. Click *here* to see Shiseido's eyebrow products. We got to try out the Shimmering Cream Eye Color. It's a cream eyeshadow that sets into a powder finish when blended, and gives the eyes a "jewel effect." 8. Line your eyes - Line your eyes according to your eye shape. To make rounder eyes appear smaller, apply dark eyeliner on the upper and lower waterlines to close off your eye. To make smaller eyes appear rounder, focus on the outer ends of your lash lines and wing out the line a bit. Apply liner only on the outer end of your lower lash line to avoid closing off your eye. Use a white eyeliner to line your waterline. 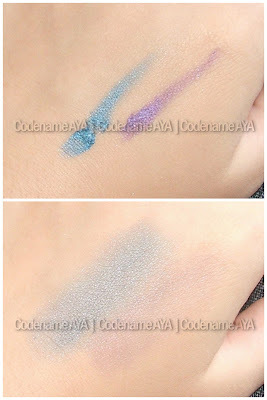 Click *here* for the list of Shiseido eyeliners. 10. Apply blush - Start by applying a small amount of blush first, and then just build up the color to your liking. To help your blush stay on longer, use a cream blush as base. Click *here* to see the blushes from Shiseido. 11. Apply lip color - Use a lip color that suits your skin tone and the look you are going for. Line and fill in your lips first to help your lipstick stay on longer. Don't forget to color the corner of your lips, too. Click *here* for the list of Shiseido lip products. Marionnaud gave the workshop participants a 20%-discount on purchases for that day only.